9/11 – Let Us Never Forget…..
and really, how can we ever forget a tragic attack like 9-11-2001 in the city of New York, or even the world. It’s kind of hard to fathom that we are now at the eleventh year after this happened but we are and while we shall never forget, I think its very important for us to all try to heal all the more strongly. Of course its easier to say this than to do it but it is important to live on and keep the memory of those we lost in our hearts and not let grief or fear cripple us. This is the day that everyone remembers where they were when it happened if they are of a certain age. My own recollection was having just gotten off the train and noticing everyone looking downtown from 23rd Street. I felt it was like watching a scene from a giant monster movie based on the smoke and the look of awe and shock on everyone. At the office the news reported a plane off course but it was soon apparent that there was more to this. We were told to leave the city but when I made it back to Brooklyn via the Manhattan Bridge all one could see in that direction were billows of smoke. It seemed odd. The MTA dropped us at Atlantic Avenue/Pacific Street and it was above ground we all went. I somehow reached my Mother with my cell phone and asked what the latest news was. “They’re gone” she replied, “The World Trade Center buildings had collapsed”. Words that I never even imagined possible and yet this was indeed the reality. I was really hoping to have some photos of the memorial park for this anniversary but I was unable to get there and still need to set that up. I know I want to do those photos right and not rush through it. I guess I can say keep watching this site for that observation when I get there. Instead please get a glance at a couple of memorial monuments that I have observed in my travels. 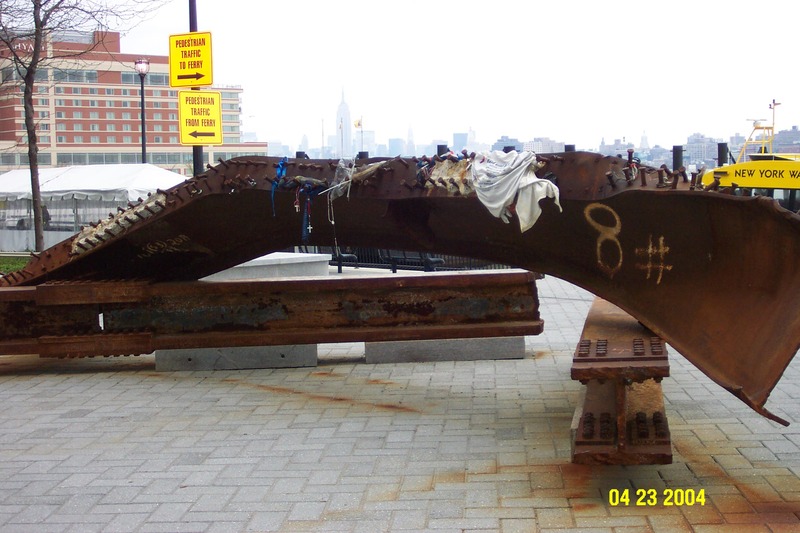 The first is a girder from one of the buildings that is positioned in Jersey City. I snapped this in 2004 when I was on an assignment over there. 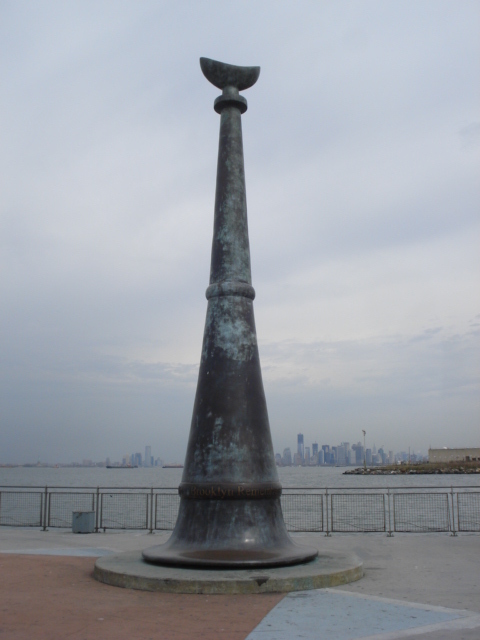 The second is a monument that stands on the 69th Street Pier down off Shore Road. 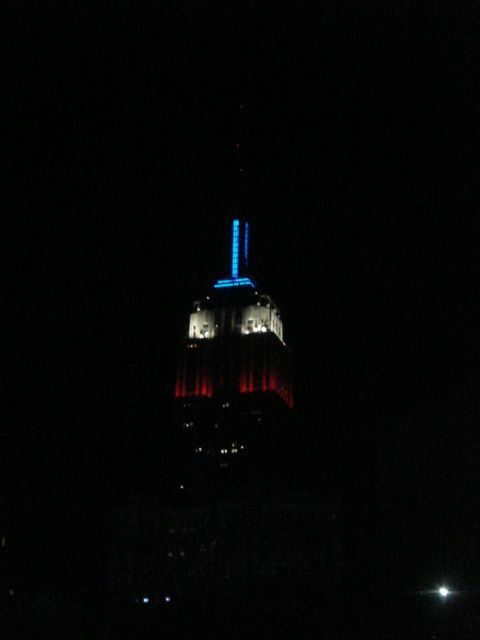 As you see in the first photo in this narrative, this evening the Empire State Building shined like a beacon in red, white and blue. The colors of our flag and symbol of the freedoms we have in these United States. Though some try to make us fear their power and despise us for these freedoms, in the end they shall never overcome the spirit of our great nation. Tonight I celebrated the memory of those lost on 9-11 with the power of music to guide me through it. Truly some powerful energy runs through melody and on a day like this one, that is a very good thing.